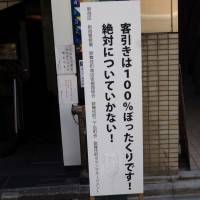 But such claims have continued to soar, and on May 29 TBS TV news reported that the Tokyo Metropolitan Police finally cracked down on a Kabukicho club called Lumine, whose 36-year-old manager, Yoshihiko Okumura, and one other employee were arrested on charges of having intimidated two male customers by refusing to allow them to leave the club premises until they forked out ¥240,000. In the four months since Lumine opened, TBS reported that it was the target of 214 complaints — accounting for nearly a quarter of all complaints about such scams received in the first four months of 2015. The shocking TBS news footage showed an overcharged customer making a mad dash for freedom, hotly pursued down the street by a club employee. Manager Okumura, who shamelessly mugged for the TV cameras, seemed to revel in his notoriety, pedaling about on a folding bicycle with the word bottakuri (rip-off) brazenly displayed on its frame. NHK news of June 2 reported that this year alone, police have received at least 1,000 complaints about overcharging by clubs in Tokyo’s Kabukicho district — a figure said to be up by tenfold from a year ago. So then, what’s behind the recent surge in claims? “With heavier penalties for fraud, the cheats who’ve been bilking the elderly in those ‘It’s me, send money’ scams have been shifting more and more to rip-off clubs,” Kageno suggested. “Perpetrators found guilty of fraud now face imprisonment without any leniency; but a first offense of the bottakuri ordinance may just involve a fine of several hundred-thousand yen. The term for rip-off — bottakuri — is derived from bōri (“excessive profits”) and dates back nearly a century to the notorious rice riots that occurred in Tokyo in the summer and autumn of 1918. Brokers and corrupt government officials had colluded to raise prices, causing extreme economic hardship and social unrest that brought down the government. Aforementioned attorney Aoshima mentioned several case studies that could be described as typical: One customer, informed by a tout that the charge would be just ¥5,000 per hour, stayed on the premises for two hours and received a bill for ¥460,920. Another man, promised a “set” system for only ¥3,000, sat through three hostess turnovers, during which the gals ordered 15 drinks. In another case, a customer promised a charge of just ¥4,000 for 70 minutes was billed ¥239,400. “After handing over the entire contents of his wallet — ¥49,000 — he was badgered into signing an IOU, to which a photo portrait and copy of his identification were attached,” Aoshima says. “If you find yourself in a place that seems fishy, to the extent possible try to record what the club staff tells you, or shoot a movie,” Aoshima advises. His website (in Japanese) warns people in advance and offers legal advice to those who have been victimized. 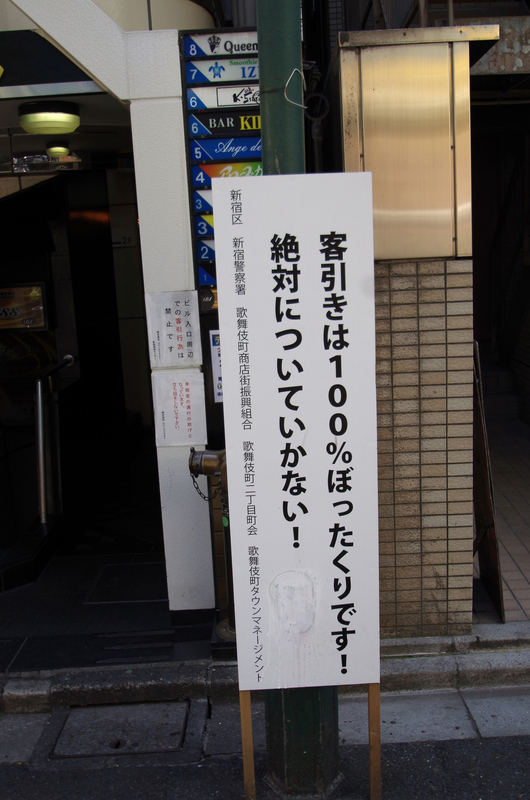 Meanwhile Shukan Jitsuwa (June 11) took note that GSK, an association of Ginza merchants, recently issued an advisory warning that similar practices are on the increase at local bars, particularly those that have been acquired by Chinese. In the past such establishments might “skim” data from a customer’s credit card, but they appear to have escalated their illegal activities to include rip-offs, not to mention spiking customers’ drinks. After beginning, “Every year hundreds of thousands of tourists have safe and enjoyable visits to Tokyo,” it urged caution in all entertainment and nightlife districts throughout Japan. The full particulars are posted at http://japan.usembassy.gov/e/acs/tacs-alert20150601.html.